Online dementia training – the future? In this guest post Professor Rose-Marie Dröes of the Department of Psychiatry at the VU University Medical Centre in Amsterdam relates her experience of developing an online training portal for carers of people with dementia. It has been a long journey, but our new STAR Training portal was officially launched on 11 October 2013 at the Alzheimer Europe conference in Malta. 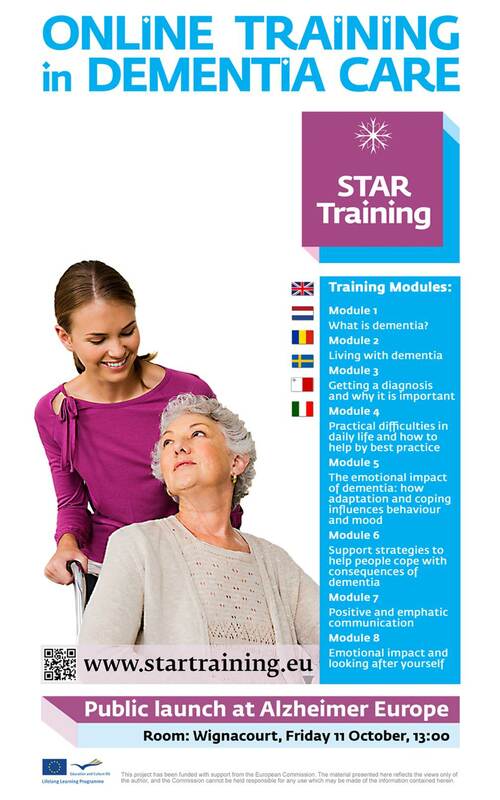 This European Lifelong Learning project (known as STAR) has created an online training portal with eight course modules covering the key competence areas for carers of people with dementia. Each module is available at two levels and we hope that the course will serve all kinds of carers, both family carers and professionals. The authors of the course modules are dementia experts from the Netherlands, UK, Sweden and Italy. The project has also included participants from Malta and Romania. Pilots are starting, and anyone can register and try it out. I have learned many things myself in this project, for instance, to really focus on the most relevant themes to include in the course modules so that they will be really useful for family carers and untrained volunteers, but also for professionals. Also, I have had to learn how to effectively use different web-based interactive strategies to support the e-learning process. What has been most exciting has been to work together both with dementia experts from different European countries and technology experts who have been able to help us to operationalize our ideas about e-learning for dementia care. This enabled us to compose an e-learning course in different languages and at the same time one that is adapted to different cultures. But I have also found several things challenging as a researcher. For instance, the writing of the modules, adapting them to the different countries, developing and implementing games, film clips, and tests all took a lot of time. We probably underestimated this in the timeline of the project. As a result we had little time to evaluate the long term effects of the course, that is to say, how it impacts on the knowledge and attitudes of informal carers and professionals. This would be interesting to investigate. Would I get involved in such a project again? Certainly yes! I think it is very rewarding to be involved in European projects in which educational products and psychosocial interventions are developed and evaluated which in the end may be used in dementia care throughout Europe. My advice for new researchers, therefore, is to get in touch with international research groups, such as the Interdem network on research into timely psychosocial interventions, and to try to participate in joint international research projects. Together we can make a much larger impact on innovations in dementia care in Europe. The Alzheimer Europe conference in Malta at which STAR was launched took place 10-12 October 2013. Twitter hashtag: #23AEC. The conference was also attended by Social Care Workforce Research Unit Director, Professor Jill Manthorpe: see Unit news items.